Chewing betelnut is a hobby of many Dai folks in Xishuangbanna. Almost all aged Dai folks regard it as something enjoyable. Why do the Dai folks like chewing betelnuts? There is a story. Once upon a time, an old couple caught stomachaches because they got angry at their disobedient son and daughter-in-law. One day, when the couple was weaving bamboo baskets under the betelnut tree, a wind blew and some ripe betelnuts dropped down. Feeling parched, they picked up one and put it into their mouths. It tasted cool and sweet with a little bit bitter and. During the night, the old couple both felt comfortable in the stomach. They chewed betelnut successively for days, and their stomachaches got complete well. Ever since then, the Dai folks formed the hobby of chewing betelnuts. Betelnut is an arbor of the palm family. It originates in Malaysia, India, Burma, Vietnam, and Philippine etc., and is most planted in India. According to the botanical classification, betelnut belongs to the same family as oil palm and talipot palm; however, their outer appearances are quite different. 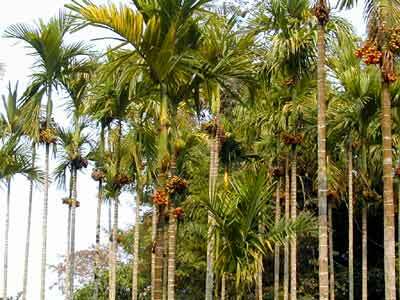 Oil palm and talipot palm are tall and mighty with thin and long leaves, looking like tall men; while the betelnut tree is thin and elegant, looking like a shy girl. Here is another story about betelnut: long, long ago, a Dai youth fell in love with a beautiful girl. The girl got lost and the young man looked for her everywhere. On his tough journey, he encountered a betelnut tree. He went to the betelnut tree to ask his love�s whereabouts. The betelnut tree raised its nose up and gave him coldly a disappointing answer. The young man was quite angry and he cursed the betelnut tree: �You will stand high and never grow thick and sturdy�. Many years have passed; until today, the betelnut tree is still so thin. In Xishuangbanna, betelnut is the symbol of wealth and happiness. In ancient times the folks used it as money; in the same time, it is also the keepsake of the young Dai people. It is said that after the marriage of a young couple, the bridegroom generally must go to the bride�s home to render his services for three years; however, if the young man can manage to climb on the betelnut tree and pick up some betelnuts for his woman, he can be exempted from such services and take the bride home. According to scientific study, betelnut is also a common medicine. Besides tonifying the stomach, it is also a good medicine for protecting the human teeth. Many old Dai folks have very strong teeth in Xishuangbanna; that�s because they often chew betelnuts. Besides, betelnut can also banish insects, cure tympanites and edema, etc.